This week’s post is about two autographs I recently received in the mail from arguably one of the best players to ever play the left wing, Bobby Hull. In his professional hockey career which includes time in both the NHL and WHA and spanned 4 decades, Bobby played in over 1400 regular season games and scored 913 professional hockey (regular season) goals. Even though, 303 of those goals were in the WHA (where the talent was a little below the NHL standard), his 610 career NHL goals were good enough for third in NHL history at the time of his retirement. Thanks to high scoring hockey in the 80’s and many talented NHL players coming into the league over the last 30 years, Bobby Hull has fallen to 16th on the NHL all-time goals list. Making all things equal, Bobby Hull does rank 9th and 3rd in career goals per game in the NHL and WHA respectively. Bobby Hull was also a beast when it came to International Hockey action. He wore the Maple Leaf twice in his career. Once as a member of the '74 Summit Series which featured WHA players going up against the Russians, and another time as a member of Team Canada in the ’76 Canada Cup. In the '74 Summit he scored 7 goals and led the series in scoring, and even though he was 38 years old in the ’76 Series he tied for the tournament lead in goals. 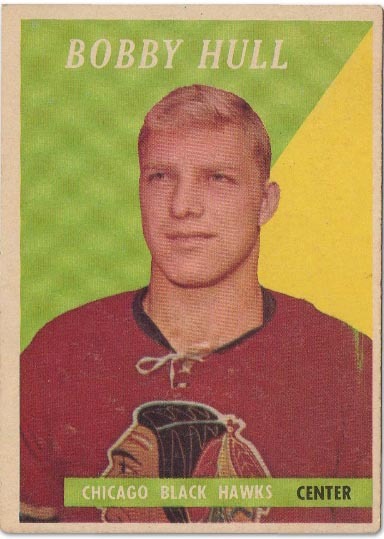 Bobby Hull was a larger than life player who helped change the game of hockey with his fast skating and amazing slap shot. He was a pioneering player who had a part in creating the first curved hockey blades which amplified his amazing blast. During his playing days there were two records that displayed his amazing skills. First was he skating speed and second was his slap shot. According to legend (which I first read in a hockey book as a kid and found mentioned again on Wikipedia), he was clocked at a skating speed of almost 30 mph (48 km/h) and his slap shot was an amazing 118.3mph which was almost a full 10 mph faster than Chara’s record setting blast. Of course technology in today’s game is far more accurate to measure these speeds and records, but let’s face it; Hull shot a puck insanely fast with a glorified tree limb. I can’t imagine what he would have done in today’s game with a one-piece stick and new skates. Writing Hull was a no-brainer for me even though I already had an autograph of his. When I was a kid, my step-father met him at an autograph session and scored me a signature on my replica Hawks jersey I used to use as a kid for street hockey. As I got older, I wished I had a signed card from him so I wrote a letter a little while back and mailed off two cards to him. I certainly can’t have a post without showing off what his rookie card looks like. Unfortunately I don’t have one, a little out of my price range with decent copies selling in the $3000+ range. This is my favourite of the two. A good classic looking card with a nice autograph that is both easy to read and the blue sharpie contrasts well with the card. I thought I would try my luck and go after two autos and sure enough Bobby Hull was nice enough to sign a second card for me. This one didn’t turn out as good as I hoped, but I certainly won’t complain as having two free autos from the best left-winger the game has ever seen is pretty cool! 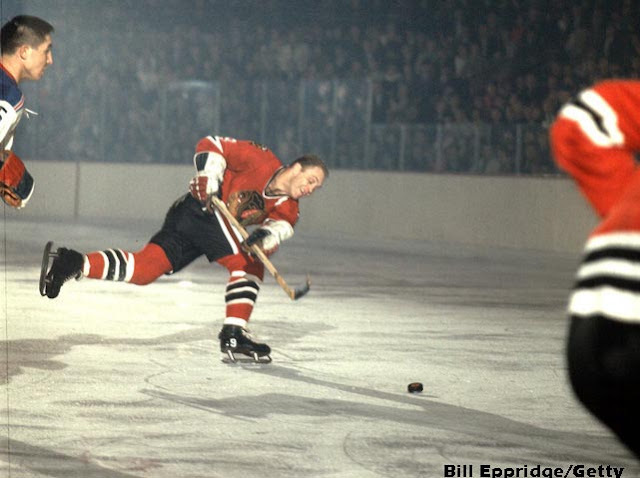 Am I the only one that thought Bobby Hull was a Right handed shot? ?